2) Make two presentations at each seminar. a)Present on overview of Alberta’s forests and industry and how it works with Canada Wood; and b)Present an overview of AFPA Grading system (building faith in grading system and standards) Completed. 3) Carry out contact sessions with seminar attendees and bring back list of suitable buyers for companies after the mission. Completed. 4) Assess wood market areas where time permits. Assessment below. 8) Meet with DFAIT Guangzhou staff who will likely attend the Shunde seminar. Contact made but insufficient time to brief. Promised to copy on report. Total AFPA costs for Mission were $ 6,467.52. Fred Spokes was in Canada during visit. Met with Helen Guo (Code and Standard Specialist) and Brad Spencer program Director for China. Yvonna Zhu is new in her Trade Officer position. Canada Wood and BCWood gave a quick overview of their programs in China. Canada Wood is facing budget cuts and several positions have not been filled through attrition process. There is a medium term goal of filling all positions with nationals as Canadian expats leave to take advantage of other opportunities. Program highlights for this year includes increased architect and carpentry school training, continue work on National Fire Building Code and preparation for Premier Minister Thomson mission in the fall. BCWood will be having booths at Beijing China Housing Industry Exhibition (CHIE) in September, Yiwu International Wood Market Fair in early November, CIFM / Interzum Guangzhou 2014 – China International Woodworking Machinery & Furniture Raw Material Materials Fair. These events will have a Canada Wood\ BC Wood booth(s). Alberta ESRD or AFPA will share the booth space with BCWood. ESRD attended the 2014 Interzum and Yiwu Fairs. AFPA will be attending the CHIE with BCWood. BCWood targets China cities for their seminars with emerging wood product markets that will provide new demand for western Canada wood products. Wood buyers are interested in sourcing our wood but lack full knowledge of the products, the industry and best use of wood species. Wood manufacturing is moving out of tier one city areas as result of rising wages, land prices and taxes. Cities like Hefei, Xiamen and Shunde Foshan are growing rapidly and have quickly developing middle classes. Wood manufacturing markets will shift to the domestic needs of the emerging middle class. Mission stops shown in picture below. Hefei formerly known as Ho-fei, Luzhou, or Luchow is the capital and largest city of Anhui Province in Eastern China. A prefecture-level city, it is the political, economic, and cultural centre of Anhui. Located in the central portion of the province, it borders Huainan to the north, Chuzhou to the northeast, Chaohu to the southeast and Lu’an to the west. Hefei has an area of 11,323 km2) and, as of 2013 Census, a population of 7,611,000 inhabitants. Its built-up area (“metro”) is home to 3,352,076 inhabitants encompassing all urban districts. The GDP per capita was ¥61,500 (ca. US$10,141) in 2013. Before the Chinese civil war Hefei was a town whose main industry was agriculture. Soon after the founding of the People’s Republic of China, the capital of Anhui was moved from Anqing to Hefei. To assist the development of the city, many talented people were sent in from other parts of the country. Modern-day Hefei has machinery, electronics, chemistry, steel, textile, wood and cigarette industries, among others. Hefei has been identified by the Economist Intelligence Unit in the November 2010 Access China White Paper as a member of the CHAMPS (Chongqing, Hefei, Anshan, MA’ Anshan, Pingdingshan and Shenyang) , an economic profile of the top 20 emerging cities in China. 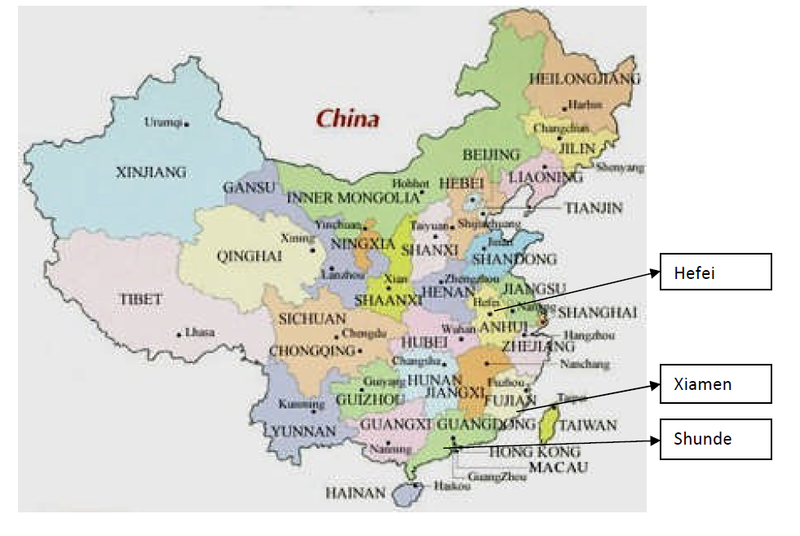 Hefei does not have direct port access but is well connected by new high speed highway access to the Yangtze River and port areas in Nanjing and Shanghai. Many of the new wood manufacturing factories are associated with Shanghai businesses and source wood and other materials from this port. Nanjing and Shanghai are the number 1 and 2 entry points for Western Canada SPF Lumber. Nanjing is the number I port of entry for Canada softwood logs. Xiamen, also known as Amoy is a major city on the southeast (Taiwan Strait) coast of the People’s Republic of China. It is administered as a sub-provincial city of Fujian province with an area of 1,699.39 square kilometres (656.14 sq mi) and population of 3,531,347 at the 2010 Census. The city’s urban area includes the old urban island area and covers all six districts of Xiamen (Huli, Siming, Jimei, Tong’an, Haicang and recently Xiang’an), and has a total urban population of 1,861,289. It also borders Quanzhou to the north and Zhangzhou making this a unique built up area of more than five million people. The Jinmen (Kinmen) Islands administered by the Republic of China (Taiwan) are less than 10 kilometres (6.2 mi) away. Xiamen and the surrounding southern Fujian countryside are the ancestral home to large communities of overseas Chinese in Southeast Asia. The city was a treaty port in the 19th century and one of the four original Special Economic Zones opened to foreign investment and trade when China began economic reforms in the early 1980s. It is endowed with educational and cultural institutions supported by the overseas Chinese diaspora. In 2006, Xiamen was ranked as China’s second “most suitable city for living”. Xiamen has a diverse and well-developed economy. Primary economic activities include fishing, shipbuilding, food processing, tanning, textiles, machine tool manufacturing, wood manufacturing, chemical industries, telecommunications and financial services. The city has economic and trade relations with 162 countries and regions worldwide, and benefits from foreign investment, particularly capital from Hong Kong, Macau and Taiwan. In 2008, a total of 356 projects with foreign direct investment had been approved in the city, with a contractual foreign investment amount of US$1.896 billion and an actual foreign investment amount of US$2.042 billion. In 1992, Xiamen was ranked among the top 10 Chinese cities in relation to comprehensive strengths with its GDP increasing by an average of over 20% annually. In 2008, Xiamen’s GDP amounted to 156 billion Yuan, an increase of 11.1% over the previous year; and the per-capita GDP was 62,651 yuan (US$9,017). Further economic reforms were introduced, and this brought the total volume of imports and exports in 2008 to US$45.4 billion, while that of exports totalled US$29.4 billion. Xiamen is also the host of the China International Fair for Investment and Trade held annually in early September to attract foreign direct investment into the Chinese mainland. Xiamen has excellent road, rail, air and port infrastructure. In the last few years, Xiamen has invested more than RMB30 billion in infrastructure construction. The Port of Xiamen is an important deep water port located in the mouth of the Jiulongjiang River. It is one of the trunk line ports in the Asia-Pacific region. It is ranked the 8th largest container port in the PRC, and ranks 17th among the world’s top 100. It is the 4th port in the PRC with the capacity to handle the sixth-generation large container vessels. In 2013, Xiamen handled 191 million tons of cargo, including 8.08 million TEUs of containers. In 31 August 2013, Xiamen Port incorporated the neighboring port of Zhangzhou to form the largest port of China’s Southeast. This was a relatively uncommon case of ports merging across jurisdictions. Xiamen is a well-developed first-class port. Dongdu harbor is located on Haicang district which is on the mainland. The coast line in the harbor area stretches for 30 kilometres (19 mi), and the depth of water reaches up to 17 metres (56 ft). The port offers 74 berths. One can handle vessels of 100,000 or more tonnes, 23 berths are for 10,000 or more tonnes, and two handle vessels between berths for 5,000 and 10,000 tonnes. There are nine container terminals. Xiamen is the first mainland port to start the direct shipment of cargo to Kaohsiung in Taiwan. The initial cargo handling capacity totalled 1.34 million TEUs of containers. The port comprises twelve areas: Heping, Dongdu, Haitian, Shihushan, Gaoqi, Liuwudian (in Tong’an District). The port is owned and operated by Xiamen Port Authority which is a department of the Xiamen Municipal Government. Shunde District, is a district in the city of Foshan in the Pearl River Delta, Guangdong Province, China. Once a traditional agricultural county, it has become one of the most affluent counties in Guangdong and mainland China. Since 2009, it is administrated independently of Foshan city, answerable directly to the Guangdong provincial government. Shunde was approved as a pilot city for the comprehensive reform of Guangdong in 1993, and also for taking the lead in accomplishing modernization in 1999. From 2000 to 2003, Shunde was ranked first among China’s top 100 counties for Basic Economic Competitiveness for four consecutive years (released by National Bureau of Statistics of China). In 2005, Shunde achieved a GDP of 2170.13 billion. Situated in the fertile Pearl River Delta, the economy was once dominated by agriculture, fisheries and silk farming. Since the Chinese economic reform, this has been superseded by industrial manufacturing and development, especially the manufacturing of furniture and electric appliances. Some mainland Chinese product brands like Kelon or Midea are made in Shunde. Recently a new technology industrial park has also been opened in this area, featuring car manufacturers such as Toyota. Today, this area has become one of the most affluent counties in Guangdong and mainland China (according to official information from the Chinese government and the United Nations). The GDP reached 127.5 billion yuan in 2007, an annual increase of 18%, and GDP per capita reached 107,991 yuan (ca. US $14,200). Shunde, China Furniture Wholesale Market is located at Shunde district which connects Lecong town and Longjiang town along the 10 km highway, Foshan City, Guangdong Province, China. Shunde has become the largest furniture wholesale market and distribution center in China and the world. It claims to be the The World Largest Furniture Wholesale Market. Shunde was named as the China Furniture Business and Trading Capital by the China National Light Industry Council and China National Furniture Association. It covers a total area of approximately 32.3 million square feet (3 million square meter) and it includes more than 200 modern furniture sales buildings, such as Sunlink Group, Lecong International Furniture Exhibition Center, Shunde Empire Group, Tuanyi International Furniture City and others. The furniture wholesale market extends more than 5 km and is arranged by 12 rows and 20 streets. There are over 3,300 domestic and foreign furniture dealers and more than 1,500 furniture manufacturers. Jointly they display over 20,000 types of furniture and products ranging from living room furniture, dining room furniture, bedroom furniture, kitchen furniture, and hotel furniture, hotel mattress, contract furniture, and restaurant furniture, cafe chairs, bar stools, bathroom furniture, sanitary ware, furniture accessories, material & hardware. The market is open year round with furniture trading more than USD1 billion in sales volume each year. There are two major furniture exhibitions held in March and August each year at Longjiang town of Shunde district. The Dragon Furniture Fair has a famous reputation of professional fair at home and abroad. Being located at Guangdong province, close to Hong Kong and Macau, the market offers convenient transportation and well-developed infrastructure. Dongguan is a prefecture-level city in central Guangdong province, People’s Republic of China. An important industrial city located in the Pearl River Delta, Dongguan borders the provincial capital of Guangzhou to the north, Huizhou to the northeast, Shenzhen to the south, and the Pearl River to the west. The three neighboring municipalities of Guangzhou, Dongguan, and Shenzhen are home to over 25 million residents, accounting for a large proportion of the Pearl River Delta Region’s population. City administration is considered especially progressive in seeking foreign direct investment in Asia and Europe. Dongguan ranks behind only Shenzhen, Shanghai and Suzhou in exports among Chinese cities, with $65.54 billion Yuan in shipments. It is home to one of the world’s largest, though largely empty, shopping malls New South China Mall. Dongguan earned city status in 1985, and was upgraded to prefecture city status three years later. During the period the city changed its focus from an agricultural town into a manufacturing hub, with an average annual growth of up to 18%. The city ranked 13th in Forbes China’s listing of the most innovative mainland cities, as well as 18th in Foreign Policy’s listing of the most dynamic cities in the world. Dongguan serves as one of the regional railway hubs in Guangdong, where the Guangzhou-Kowloon Railway, Guangzhou-Meizhou-Shantou Railway and the Beijing-Kowloon converge. Rail services in and out of the city call at Dongguan railway station where there are direct train services to Guangzhou East railway station in Guangzhou; and Hung Hom Railway station in Hong Kong. Among the four railway lines (R1-R4) planned for the Dongguan Metro, R2 line is presently under construction and is scheduled to open for operations in early 2015. The R2 Line will link towns in Western Dongguan, thereby promoting the connection of the entire downtown area with Houjie, Humen and Chang’an. It will also support Dongguan’s regional transportation with other cities such as Guangzhou, Shenzhen, Hong Kong by joining with the rail transit junctions of the Pearl River Delta. BCWood and ESRD did a grading seminar in Dongguan area in November 2013. This seminar was co-hosted hosted by the Dongguan Timber Association. Biggest Wood Distribution center in South China. Annual sales 10 billion Yuan annually. Sell lumber, veneer, MDF, panel product, carts. No Canadian OSB sold here. (German pine OSB) Buy wood products from around the world. Going forward they are interested in selling and distributing SPF and Canadian OSB panel board. They plan to move entire timber market to new location. (At the Dongshun Container Flooring Facility) The existing timber market will feature SE Asia and Africa “red woods” hardwood. The Mother company has global investments in many different commodities and technologies. The Dongguan operation has control of rail and dock side logistics for most of the furniture companies –in the region. Houjie Town is located at the east bank of the Pearl River Delta, the middle section of the Guangzhou-Shenzhen economic corridor. In the south it borders Humen Port, and in the north it links to the Dongguan city proper. There is a total area of 126.15 square kilometers under its jurisdiction, with a permanent population of 93,000, and more than 400,000 as a temporary population. It is a town of old and prosperous business and trade, rich in products like Guancao (Dongguan Grass). Its industrial, commercial and trading enterprises were all set up and developed from traditional lines and are thriving and deeply rooted in Houjie Town. Throughout 30 years of reform and opening up, rural industrialization and urbanization were achieved, making the town a new modernized industrial town of the Pearl River Delta region. In recent years it has been successfully honored as a “Town of Hygiene in China”, “Famous Town of Exhibitions in China”, “Town with the Strongest Education in Guangdong”, and a “Civilized Town of Dong City”. Houjie town is famous for shoes design and manufacturing center.